Directions To clean, disinfect and remove protein daily, complete these simple steps: STEP 1: Thoroughly rinse each side of the lens (5 seconds) with ReNu MultiPlus Multi-Purpose Solution. 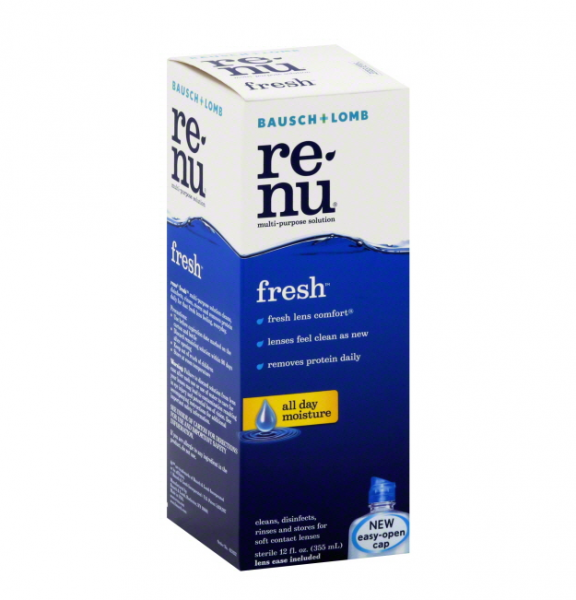 STEP 2: Place cleaned contact lens in the lens case and fill with fresh ReNu MultiPlus Multi-Purpose Solution. Soak at least four (4) hours. Always follow your eye care professional's instructions. Based upon your individual tear chemistry and lens-wearing schedule, your eye care practitioner may recommend additional products or procedures such as placing 3 drops of this solution on each lens surface and rubbing for 20 seconds before Step 1. STORAGE: You may store your lenses in the unopened lens case until ready to wear, up to a maximum of 30 days. See inside of carton for complete cleaning and disinfection directions. Uses Keeps soft contact lenses clean and comfortable. Clean, disinfect, and remove protein deposits daily without rubbing your lenses! ReNu MultiPlus Multi-Purpose Solution contains HYDRANATE, poloxamine and DYMED to create a soft lens care product that keeps lenses clean and comfortable by removing protein deposits every day without the need to rub. Daily use of ReNu MultiPlus Multi-Purpose Solution eliminates the need for a separate enzymatic cleaner or daily cleaner for many lens wearers - consult your eye care professional. Warnings SEE INSIDE OF CARTON FOR COMPLETE INSTRUCTIONS AND IMPORTANT SAFETY INFORMATION. NOT FOR USE WITH HEAT DISINFECTION. IF YOU ARE ALLERGIC TO ANY INGREDIENT IN THIS PRODUCT, DO NOT USE. PRECAUTIONS: Never re-use this solution. Keep the bottle tightly closed when not in use. Store solution at room temperature. Use before expiration date marked on the carton and bottle. Keep out of reach of children.